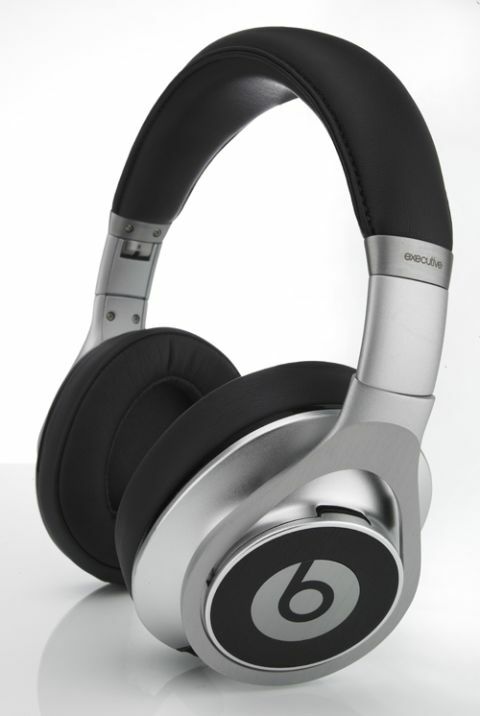 Beats by Dr. Dre Executive review | What Hi-Fi? If you were to take a quick visual survey of high-street headphone fashion, you’d notice two brands appearing again and again: Apple, with its trademark white earphones; and Beats, with models such as the Beats Executive we have here. The company, co-founded by former N.W.A. rapper Dr Dre, has a solid track-record of producing desirable, stylish and punchy-sounding headphones, but the Executives mark its first move into the high-flyer market. We mean that literally, too, for these are noise-cancelling cans – and are hoping to turf the Bose QuietComfort 15s right out of their seat in First Class. The Beats Executives make a cracking first impression. Open the box and you’re presented with an attractive and sturdy carry-case, two 3.5mm leads (one with a one-button remote/mic unit), batteries, an aeroplane adapter, 6.3mm plug, a cleaning cloth, and the usual manuals and marketing materials. Plus the headphones, of course. And what a pair of headphones they are. Flawlessly constructed from stainless steel and aluminium alloy, they drew admiring glances from all in the office – and equally enthusiastic ‘oohs’ and ‘aahs’ when people tried them on. The soft leather on the ear-cups (which sit on your ears rather than around them, as the Boses do) feels lovely and comfortable, and the leather headband doesn’t dig in. Likewise, though, they don’t grip your head like a vice; you can nod your head with confidence. The Executives fold, too, which is a boon for any traveller. At 340g the Beats are heavier than their Bose counterparts (227g), but a shade lighter than the likes of Logitech’s UE9000s (378g) and the PSB M4U2s (362g). That might sound like we’re being overly specific – but try wearing a pair of headphones over a nine-hour flight and you’ll soon realise that every gram matters. The magnetic battery-compartment cover on the left earcup is a particularly nice touch. Not only does it look nice and work well, it’ll probably last a fair bit longer than the usual plastic-catch mechanism you find on these things. Before running in, we check out the Beats’ noise-cancelling abilities. Which brings us on to our first two gripes: like many such designs, the Executives won’t work at all without being switched on (so if your batteries run out, that’s not only the end of your noise-cancellation, it’s the end of your music too); and when they are switched on, there’s an annoyingly constant hiss. Anyway, the show must go on. We give the Executives a short listen, pre-run in, to get a measure of their character. As you might expect, the bass is on the ‘phat’ side. These cans don’t shy away from giving low-frequencies their full attention – but they don’t have quite the same attack as other models in the company’s range. The treble is pretty sweet-sounding, though, and there’s nice detail to snare drums and cymbals. After a good 24 hours (and a battery change), the sound settles down into itself. It’s more cohesive, but still lacks that punch and zing we were hoping for. The bass is as weighty as ever, but still isn’t tight enough to really help the music move along – and that’s a shame, because the midrange is quite pleasing. There’s decent detail to percussion, the leading edges of snares and toms, and vocals have a nice, natural sound. Crank them up and the treble hardens quite a lot, with hi-hats and crash cymbals becoming rather harsh and brittle. Listening to mellower recordings mitigates this, but the Beats really seem built for pop – so it’s wise to keep the volume under control. Overall, though, it’s a slightly flat, tired-sounding performance – one that’s at odds with the rest of the Beats we’ve heard. We want more agility at this price; more pep, more attack and more in the way of dynamic range. There’s a lack of light and shade here, which masks some of these cans’ real skills. There’s such a thing as too easygoing, and that’s the case here. We can forgive the Executives’ lack of neutrality, however.. They don't have the airiest or most natural sound compared with the Bose QuietComfort 15s. And neither do they stack up to the Logitechs or PSBs in the ‘fun’ stakes – both of these will have your toes tapping away with their more assured performances.